Our company is engaged in exporting and supplying of Zigbee Embedded Network Trainer. Wireless embedded communication design, manufacture and integrate innovative, practical and easy to implement wireless solutions. These solutions provide our customers a fast track to either incorporate wireless technology within their current products or to simply design a new product range with built in wireless technology. Using the Zigbee Embedded Network Trainer, user can transmit the data wirelessly from the coordinator (connected to the PC) to the two end devices node (connected to the Trainers) or vice versa. So that user will able to run different experiments in both communication trainers wirelessly. The coordinator (Transmitter) will transmit the data to the all end devices of different short address, MAC address without the routers. This all can be done using the manager software, which is used to detect different end devices of different short addresses. So just select the end device node where user want to transmit data. Communications between the host (Transmitter) and Trainer (Receiver) is in ASCII format. The wireless industrial serial terminal provides a fully compliant wireless coordinator, Router and End device function via a standard interface. Suitable for home/building automation, industrial control and monitoring, low power wireless sensor networks, PC peripherals, set-top boxes and remote controls, consumer electronics etc. High performance and low power consumption. Operates on battery power input of 3~5V. Excellent receiver sensitivity and robustness to interface. Used as coordinator, router or end devices. Wireless sensor networks, particularly IEEE802.15.4/Zigbee systems. Home and commercial building automation. 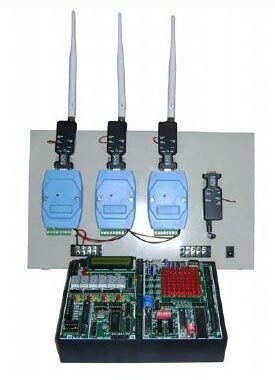 Industrial control and monitoring system. Setup boxes and remote controls. Communicated wirelessly at 2.4GHz,/2.5GHz, range 100 ~ 300 ft , various badurates, Data rate of 250 kbps and 8 bit data. Power Supply : +5 to +6 V dc.